Our last blog addressed using dynamic seating to prevent equipment breakage, particularly with clients who exhibit increased muscle tone. These clients often display strong extension, sometimes referred to as an “extensor thrust.” This intermittent and strong force can lead to breakage of the wheelchair seating system and frame. Another group of clients frequently experience equipment breakage. Many clients with a variety of developmental disabilities tend move a lot and frequently rock in their wheelchair seating system. 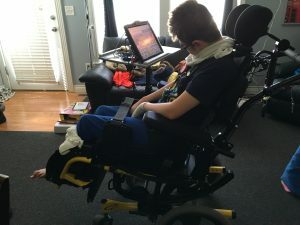 This rocking movement may be so strong as to literally “bounce” a manual wheelchair across the room and can lead to the wheelchair tipping over. These clients may be seeking vestibular input and often demonstrate reduced rocking movements when other sensory stimulation is provided. Continuous rocking, as well as forceful rocking, can lead to damage of the wheelchair seating system and frame. Providing dynamic seating, particularly at the hips, allows the client to rock and move while absorbing these forces. This is typically addressed with a dynamic back. Absorbing the force protects the wheelchair and seating system from damage. Breakage is probably the initial reason that people seek out a dynamic solution and is what started me down this path in 2005. The number of times that we hear about broken back canes, seat frames and footrest is staggering. We have heard about complete wheelchairs being destroyed within days of delivery. The feedback that I have received over the past ten years has made me a firm believer that restricting movement is not a good thing. As able bodied we don’t sit still for long, we are constantly moving and to expect someone in a wheelchair to be tied into a chair and unable to move without exerting enough force to break things is inappropriate! I’ll leave my views on the physical and mental benefits for another time. Have you ever come across dynamic molded backs? Kate, this is a great question! The main challenge of opening the seat to back angle when using a molded back is that some shear occurs and the client may not remain in alignment with the contours of the back. With that said, I often use dynamic back hardware with molded backs, but we only allow about 10-15 degrees of recline. This avoids much of those shear forces. The Dynamic Rocker Back only allows about 15 degrees of movement which does reduce the concern of disrupted alignment from shear forces. Greg, your work has “saved” many wheelchairs from breaking over the years, I’m sure! I agree, I hate to sit still! Movement is so important and I would argue is a human right.